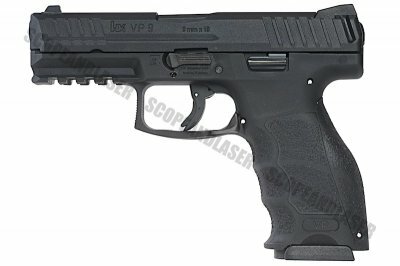 The Heckler & Koch VP9 is a polymer-framed semi-automatic striker-fired handgun. VP stands for Volkspistole which translates to "people's pistol" which is perfect for who its catered to. For those that wonder what the 9 means is that it stands for the caliber designation of 9mm. 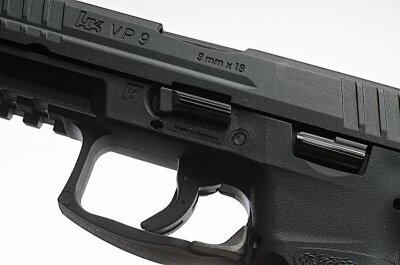 The VP9 is the 3rd striker fired pistol that H&K ever produced. It is known under the designation SFP9 in Europe. For those who never heard of VFC, they are known to make realistic and high performing airsoft guns in the airsoft market. 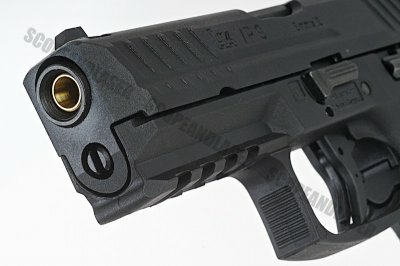 The newly designed striker system that gives the VP9 a single stage like trigger feel with a clean break, which is awesome with that superb recoil. Pulling the slide back is a breeze, and holding this in your hand just feels so comfortable. All the modifications you can make are very simple. 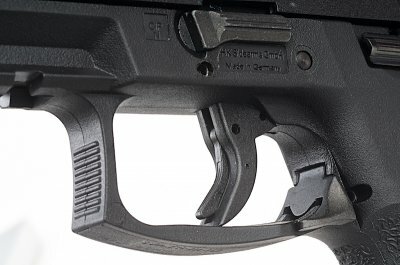 The hop up can be adjusted like every other airsoft pistols, slide the dial on the left side of the gun down at a angle of 90 degrees. From there just push the slide forward and you have access to the hop up system under the slide. All the functions work just like the real steel variant such as the slide and trigger lock. It features a under rail where you can add any type of accessories you desire. Once you made your adjustments in, it's very accurate and incredibly stable. 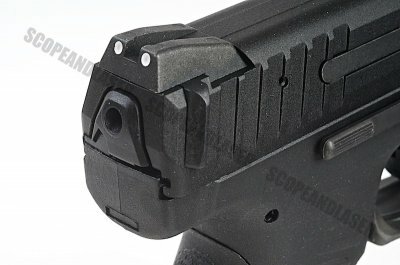 Lets not forget it comes with extra grip inserts for those who don't like the standard grips. Picking off your targets in close range will be a breeze and we think VFC have done a very good job designing a pistol that could compete in this market so late in the game. Umarex Sportwaffen GmbH & Co. KG is a German manufacturer of air guns, tear-gas and signal pistols, paintball markers under the RAM brand and airsoft guns, based in Arnsberg, North Rhine-Westphalia. The firm was founded in 1972.The United States subsidiary of Umarex is called Umarex USA and was created in 2006 after acquiring the United States marketers of the RWS brand (formerly part of Dynamit Nobel), which they continue to market. Umarex USA markets Umarex airguns in addition to many other airguns under license from various firearm brands that include Beretta, Browning, Colt, Hammerli, HK, Makarov, Ruger, Smith & Wesson, UZI, and Walther. Umarex USA entered the tactical rimfire market in 2009 with the importation of Walther-made Colt M4 and M16 .22 LR guns. The company has in-house brands including entry and mid-level airsoft guns in their Tactical Force and Combat Zone brands, while reserving their Elite Force brand for premium airsoft guns. The Legends line is based on historical guns in a BB or pellet airgun format. In late 2010, the company began offering a Turkish-made M1911A1 chambered in .45 ACP under the Regent brand.